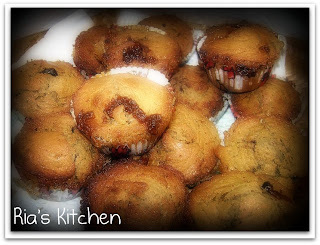 another variation of muffin. this one is easy enough and pretty good for lunch box. Preheat oven to 180 degree celcius. Line a 12 hole muffin tin or two 6 hole muffin tins with paper cases. Combine flour, coconut and sugar in a large bowl. In a separate bowl whisk together yoghurt, eggs, oil and essence. Add yoghurt mixture to flour mixture, add diced peaches and stir until just combined. Deivide mixture between muffin cases. Top with peach slices. Whisk together sugar and eggs until thick. Add butter, flour and then milk. thrown in frozen raspberries and white chocolate chips. Stir gently to combine. Spoon into muffin tins. 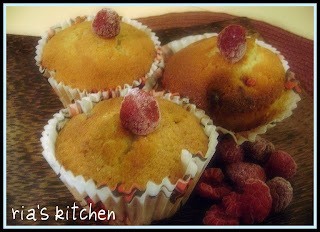 Press into the top of each muffin extra raspberries and white chocolate shops. Bake in a moderate oven for approximately 30 minutes or until golden brown. Line each muffin tin with paper baking cups. Peel pears, remove cores, and dice finely. Heat pears, vanilla, lemon juice and simmer for 3 minutes over low heat. Stir in Nutella and let cool slightly. Preheat the oven to 200C. Chop chocolate into small pieces. Combine flour, cocoa, and baking powder. Whisk together eggs, sugar, yogurt, and oil. Beat in flour mixture. Fold in Nutella-pear cream. Stir in chocolate pieces. 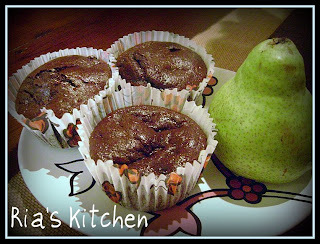 Spoon batter into muffin cups and bake in the oven for 20-25 minutes. Leave in the tin for 5 minutes, remove, and cool on a cake rack. This recipe I got it from a friend’s Multiply, Venny Ng. I tried it the other day and it’s so yum and it’s very easy to make. Good company for a cuppa! Preheat oven to 204 degrees Celsius. Line the muffin cups or tray with paper muffin liner. Dissolve the coffee in 1 tbsp of boiling water and allow to cool. Sift the flour and superfine sugar into a bowl. Combine the eggs, milk, melted butter, dark chocolate, and the coffee mixture, and roughly mix with the dry ingredients. Spoon the mixture into each muffin cup. Heat the un-melted butter and brown sugar, and stir until the sugar dissolves. Spoon the mixture onto each muffin, gently swirl into the muffin using a skewer. Bake for 25-30 minutes or until risen and cooked through when tested with a skewer. in a mixing bowl mash the banana, add the milk, egg and melted margarine, mix well. stir the flour, sugar, choc bit into the banana mixture, mix only until the ingredients are combined. 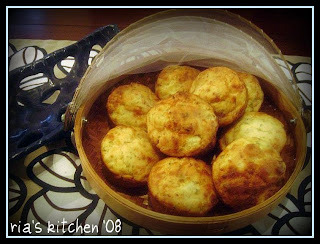 spoon mixture into well greased muffin tins. bake at 190 Celsius degree for 20 minutes or til it cook.